Where can we start? Of all the abc worksheets in this set, this one is the only one that has the letter p, both uppercase and lowercase no less, in all kinds of different forms – big bubble letters, an assortment of fonts, and dashed line lettering. Kids can learn from this assortment of Pps that no matter what a p looks like, it will still have the same basic structure. 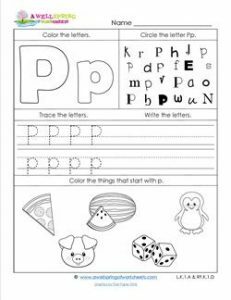 Hope they have fun and learn a lot from this alphabet worksheet.